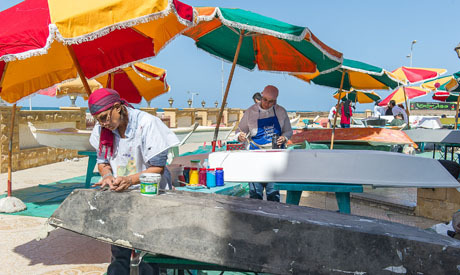 The third annual Borollos Symposium for Drawing on Walls and Boats took place in the fishing town of Borg El-Borollos, in northern Egypt’s Kafr El-Sheikh governorate, between 1 and 13 October. The initiative started in 2014 with the aim of decorating the town's houses with murals and adorning fishing boats with vibrant paintings. The annual event is organised by the Abdel-Wahab Abdel-Mohsen Foundation for Culture, Arts and Development, and invites Egyptian and international artists as well as the town's own residents to contribute to the project. Some 25 artists from 10 countries, including Bahrain, Jordan, Tunisia, Sudan and Portugal, participated in last year's edition. According to curator Eman Ezzat, the symposium has grown over the past editions. This year's edition hosted 40 artists, and comprised 15 international artists from 14 different countries, including Senegal, India, Serbia, Macedonia and Saudi Arabia. “Not all artists can make murals or know how to take into consideration the effects of weather conditions on the coastal town, which can possibly affect the works later on. Also, not all artists are comfortable with painting on streets. These were some of the things we considered while head-hunting the artists,” Ezzat told Ahram Online. Bright colours take over the otherwise plain grey cement and red brick buildings, adorning them with flowers, birds, marine themes, as well as characters and scenes that evoke folkloric tales. Colourful satellite dishes are depicted in one of the murals. 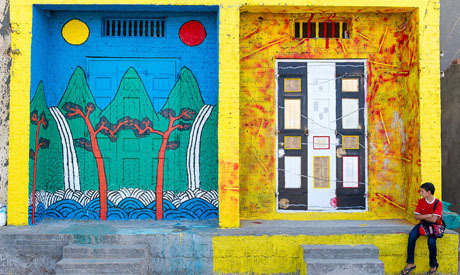 The designs transform the town's walls to canvases, and camouflage doors to look like entrances to other worlds. Riham El-Sadany, one of the artists who participated in this year's edition, talked to Ahram Online about the different aspects of the symposium. “On the one hand, it’s mostly about involving the locals and interacting with them, in an effort to integrate more art into their lives. Another aspect is bringing all these artists to spend time together for the 15 days. And lastly, each artist is given small boats to paint on, which are collected for an exhibition held in Cairo afterwards,” she says. According to Ezzat, the venue of this year's exhibition has yet to be decided on, as they are searching for a space that can accommodate all 40 boats and do them justice in presentation. “All the designs are really beautiful, and the artists created wonderful works,” El-Sadany attests. For her own boat, El-Sadany painted the side panel with a series of dancing women, as if responding to a tribal African rhythm, painted in black against a white background. At the bottom of the boat she depicted another woman, this time in colour and with a more modern look, her lips and hand blowing a kiss that scatters the petals of a rose. “This woman is more similar to the ones in my other paintings,” she says. Unlike the boat, with which she had total liberty, painting murals on the locals' homes was a different experience for El-Sadany. “When you’re painting on someone’s home and in their neighbourhood, you have to be considerate and make something appropriate. They have to like it in the end,” she asserts. Though in past editions locals were happy and hospitable to the artists and the project as a whole, Ezzat says their hospitality was even more vivid this year. In a 2015 interview with Ahram Online, Abdel-Mohsen, founder of the organisation behind the event, talked of how the festival can over time change the infrastructure of the impoverished area and enrich its community. “With raised interest in the town and the governorate, new skills and jobs will be created, perceptions of beauty will be instated and hopes infused,” he said. “We tell them that it’s not just about beautifying the city, but that it's about making them happy, widening their scope of opportunities, and putting this city, which sits at such a strategic beautiful spot between the lake and the sea, under the spotlight,” Ezzat added. El-Sadany also shared some heartwarming anecdotes of her encounters with local children and their interaction with the artworks. “There were many comical situations. The children were so excited and just couldn't wait to see the finished work. They kept guessing what it will be like and were making funny comments the whole time. While El-Sadany has attended similar events before, she thinks this symposium has a special flavour. “Seeing as the organisers are artists too and [that the symposium] does not seek profit, this makes a big difference in the overall spirit while working,” she says.